The trotter Bezymianka II belongs to the Orlov breed and was bred by V.N. Zoubov. He is accompanied by a galopping horse meant to stimulate the trotter, a pace maker. Such a horse is called ‘podovyni’ in Russian. The shoes of the horses must be provided with sharp studs to enable them to trot on snow and ice. This is presumably a contest on ice, and the judging committee is watching from a platform on the background. Sverchkov was the leading Russian horse painter in the 19th century (1817-1898). 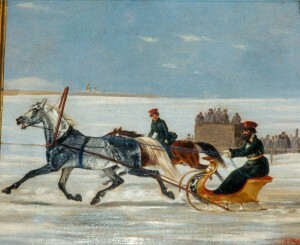 Trotting races were very popular among the leading circles in the 19th century, and continued to be so after the revolution of 1917 during the communist period until the present time. Nowadays at the race course of Moscow 800 trotters are in training. In winter time sulkies are replaced by sleighs. 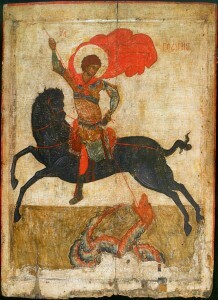 This version of Saint George is rather unique because he rides a completely black horse, in stead of a grey one. A grey horse is often a symbol of victory or leadership, but here the artist preferred a black horse. Black horses are more difficult to find than grey ones, so Saint George still has a mount that stands out. The rider is dressed as the Roman soldier he was supposed to be, but other images show him as a medieval knight, like Dürer did. The maiden on the background is missing here, although she is an essential part of the legend. The black horse with its red harness and the red flowing cape of Saint George, make this image particularly attractive and elegant. The dragon being killed by the long spear of the rider, is much bleaker than the horse and rider, so indicating the order of importance. This icon owes its artistic value to the black horse. Saint George is especially venerated in the Greek Orthodox Church, but also is the patron saint of England and several European cities.